The political fortunes of the Republican party have been heading south in recent years, both literally and figuratively. A Daily Kos/Research 2000 national poll (September 14-17) found that, whereas 50% of respondents from the South gave the GOP a favorable rating, the percentages doing so from the Northeast, Midwest, and West regions were minuscule, ranging from 7-14%. These findings have sparked some commentaries from the blogosphere (here and here; hat tip). In today’s entry, I provide such a breakdown for support of President Obama’s and the Democrats’ health care reform proposals. Before presenting the results, I want to warn that the information is limited, due to many pollsters’ either not providing cross-tabulated percentages (i.e., demographics by support) at all in their free online documentation, or not doing so by region. Despite the different areas of focus in the questions used in this analysis (i.e., general support for reform, the public option, Obama’s handling of the issue), the trends were pretty similar across polling outfits. As seen further in the graphs, Southerners were pretty consistently the least likely regional group to respond favorably to Obama and the Democrats’ reform plans. 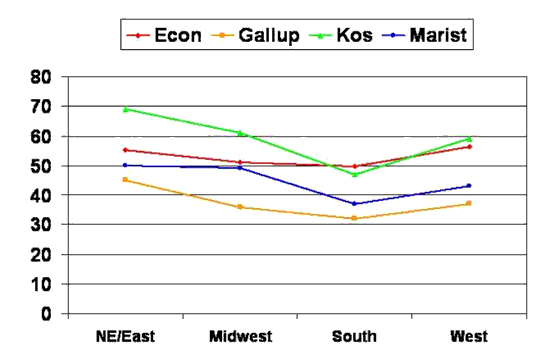 However, the dip in support from the South (relative to other regions) is not always that large, particularly compared to the Midwest and the West. Thus, the South does not appear to be as different from the rest of the country on health care attitudes as it was on favorability toward the Republican party. The nature of the questions and dates in the field for these polls are as follows. I am also monitoring state-specific polling numbers.